The owner Mr.Kostas is an amazing person . The resort is places at a forest that you can renew your soul your body. Amazing place to rest , to spend your best times with the beloved ones . This resort is a unique experience. 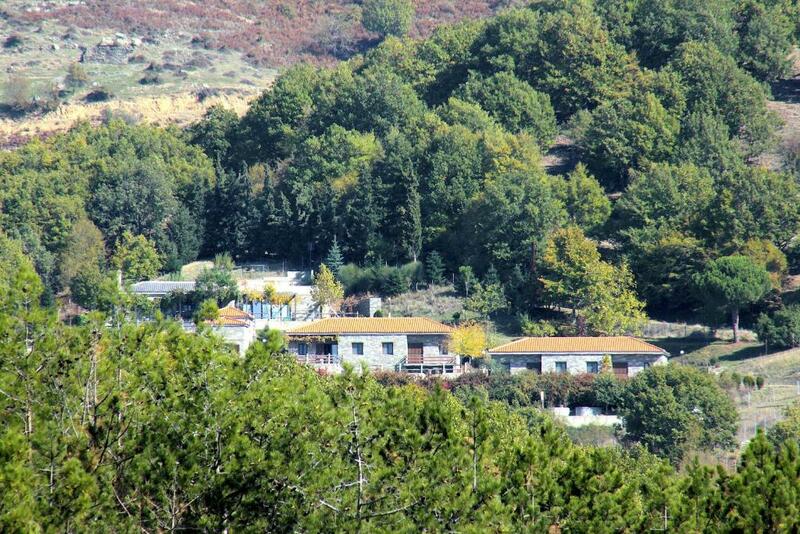 It is located in the middle of a beautiful mountain forest just 20min from Xanthi. The owners were very friendly and very good advisors if you want to explore the whole region. The surroundings are exceptionally beautiful with a stunning view and the owners are wonderful - they're always ready to answer questions and provide service or information. They are also friendly and interesting people and a pleasure to meet and talk to. Our cabin was comfortable and had everything we needed for an enjoyable stay, with parking just outside. Right above Xanthi in the mountains if that is your preference. Road a bit of a challenge but worth the effort! Great alternative to the town or city life. Stunning views and sunset. Lovely cottage and stunning hosts. Beautiful landscape,the quietness in the mountain,and the incredible hospitality of the owner and his wife Kostas and Vicki. Αρχικά να σας πω ότι οι ιδιοκτήτες είναι καταπληκτικοί άνθρωποι και εξυπηρετικοί σε ό,τι χρειαστεί κανείς. Φανταστικό μέρος για ηρεμία και ξεκούραση, ιδιαίτερα ρομαντικό με καταπληκτική θέα. Βάζω 10 με τόνο. εξαιρετικοί οικοδεσπότες! ο κ. κώστας και η κ. βίκη ήταν ιδιαίτερα φιλόξενοι και μας έκαναν να αισθανόμαστε πραγματικά σαν στο σπίτι μας! η τόποθεσία είναι φανταστική, επαρκώς απόμερη για όποιον θέλει να χαλαρώσει και να ηρεμήσει αλλά παράλληλα δίπλα στη ξάνθη ώστε πολύ εύκολα (περίπου 20 λεπτά) να φτάνεις στην παλιά πόλη. Lock in a great price for 916 Mountain Resort – rated 9.8 by recent guests! Located among oak and pine trees in Panagia Kalamou, 5.3 mi away from Xanthi, 916 Mountain Resort offers stone-built houses with fireplace and a balcony overlooking Mount Rodopi. A kitchenette with cooking facilities, dining area and electric kettle is included in all apartments at the Mountain Resort. Each has BBQ facilities and an LCD TV. Breakfast is served in each apartment. Traditional taverns can be found at the villages of Stavroupolis and Dafnonas, within 19 mi from the property. Staff can arrange activities such as canoeing-kayaking. The area is ideal for hiking, while mountain biking facilities are provided at 1,650 feet from 916 Mountain Resort. Free private parking is possible on site. When would you like to stay at 916 Mountain Resort? Stone-built apartment with fireplace and a balcony overlooking Mount Rodopi. A kitchenette with cooking facilities, dining area and electric kettle is included. Each has an LCD TV. BBQ facilities are available. Είναι το ποιο κοντινό κατάλυμα στην πόλη της Ξάνθης και σου δίνει τη δυνατότητα της εύκολης και γρήγορης πρόσβασης στην Παλιά Πόλη. Βρίσκεται μέσα σε δάσος βελανιδιάς ,οξιάς και πεύκων με τέλεια θέα βόρεια με την οροσειρά της Ροδόπης και Νότια με την θάλασσα (Θάσος) δίπλα στα πομακοχώρια. Σε απόσταση 500 μέτρων απο εμας βρίσκεται το πάρκο MTB bike park για τους λάτρεις της ορεινής ποδηλασίας με μία πίστα που καταλήγει σε αυτό 3χλμ. House Rules 916 Mountain Resort takes special requests – add in the next step! Please contact 916 Mountain Resort in advance for directions. Please inform 916 Mountain Resort of your expected arrival time in advance. You can use the Special Requests box when booking, or contact the property directly using the contact details in your confirmation. Nothing , everything is perfect . The road to reach the resort is a 4km gravel road and you need at least an SUV.